Making Your Own Lobster Bisque Isn’t As Hard As You Would Think! We’ll Walk You Through It! We’ve been focusing a lot on vegetable, or meat and poultry soups, but what about a great seafood based dish? 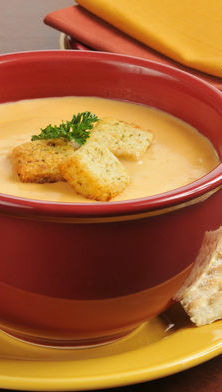 Today we’re featuring our favorite lobster bisque recipe! Use kitchen shears to cut lengthwise through the top of each lobster shell. Flip the tail over and cut lengthwise through the underside. Use the cuts in the shells to use your cutting through the lobster meat, cutting the tail in half lengthwise with the meat still in the shells. Cut each half crosswise into several chunks, then rinse the lobster under cold water and remove any visible veins. In a dutch oven or large pot, melt the butter over medium heat. Add the chopped tails and cook until the shells are bright red (about 3-5 minutes). Add the shallots, celery, and carrots, and cook until softened (5-7 minutes). Stir in the garlic and saute for another 30 seconds to a minute, or until fragrant. Pour in the sherry, then increase the heat to high and simmer until almost all of the liquid had evaporated (3-5 minutes). Stir in the tomatoes, tarragon, paprika and thyme followed by the lobster or shellfish stock. Bring to a boil, reduce the heat to medium-low and simmer for 20-25 minutes. Strain the soup through a fine mesh sieve and return the liquid to the pot. Place the solids in a heavy duty blender and process until smooth. Add the puree back to the dutch oven, then bring the mixture to a simmer and cook for another 10 minutes. Strain the bisque through a fine mesh sieve lined with cheese cloth, pushing down on the solids with a wooden spoon or with the back of a silicone spatula to get out as much liquid as possible. Discard the solids. Return the bisque to the Dutch oven. Add the warm cream and saffron, and bring to a gentle simmer. Whisk the flour into 2 tablespoons of cold water (or the stock you used) and add to the bisque. Continue cooking until the soup reaches your desired thickness (about 2-3 minutes). Add the salt and white pepper to taste. Garnish as desired. Serve hot with bread.